We have 1 2nd hand card in stock with manual that looks new. 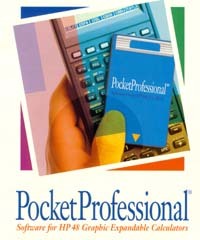 The Pocket Professional Series by Sparcom. Transform your HP48 into a gaming machine. Ten games, including Blackjack, Vadars, Diamonds, Keno, Poker, Reversi, Roulette, Slots, Skunk and Sokoban. Suitable for HP48SX or HP48GX, but only 8 of 10 games work on the HP48GX. Since the card was originally designed for a 48SX, Diamonds and Vaders do not work on the HP48GX.